Our Oldies format focuses on the best on the 1960s, 1970s, and 1980s. We strive to create high quality programming for our listeners and targeted audiences for our advertisers, and to attract, develop, and sustain an efficient and highly productive group of broadcast professionals. To provide exceptional, entertaining, and informative local radio programming. To provide the highest quality marketing solutions, results, and customer service to the advertisers who make our existence possible. To be ambassadors of goodwill by promoting social, retail, and economic growth and development. To preserve and expand on the traditions and values of local community-focused broadcasting. MARKET: East Central Alabama – Sylacauga, Childersburg, Oak Grove, Fayetteville, Goodwater, Rockford, Sycamore, Alpine, and Winterboro, west to the edges of Birmingham, north to Talladega. COVERAGE: Parts of Talladega, Coosa, Clay, Shelby, Calhoun, and Tallapoosa Counties. FORMAT: Oldies, focused on the best music from the 60s-70s-80s, and a solid information commitment with state and local news, sports, and weather. RESULTS: Everything we do is about being distinctively relevant, professional, and top quality. We are committed to the communities we're licensed and privileged to serve and are dedicated to keeping our advertisers happy with business-building results. If you're having trouble generating traffic, we're here to help. A RadioAlabama team member is standing by! No matter what your goals, we want to help your business reach its full potential. Call us at 256-249-4263 or 855-984-1604 (toll-free) to find out more about what we can do together! We believe in finding creative ways to give back to the communities in which our employees, advertisers, and listeners live, work, and play. KiX 96.3 : Hit Kickin' Country! KiX Country! 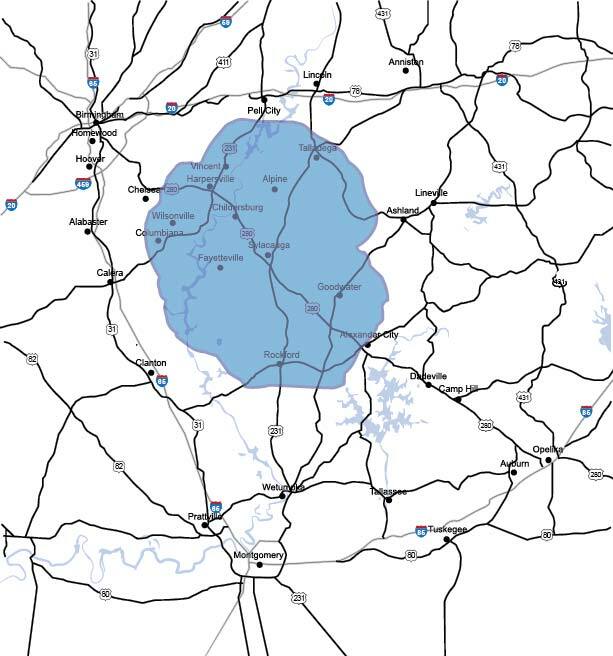 Member Sylacauga Chamber of Commerce, Greater Coosa Valley Chamber of Commerce, Greater Talladega and Lincoln Area Chamber of Commerce, Coosa County Chamber of Commerce, Alexander City Chamber of Commerce, Dadeville Chamber of Commerce, Alabama Broadcasters Association, and National Association of Broadcasters. Home of Alabama’s 2017 Radio Station of the Year, Alabama’s Best Morning Show of 2016 and 2019, and the Alabama Broadcasters Association’s 2014 Broadcaster of the Year. Winner of 2013, 2015, 2016, 2017, 2018, and 2019 ABBY Awards for broadcast excellence. Honored with the 2018 Cornerstone Award from the Sylacauga Chamber of Commerce.